Kamloops’ favourite countertops shop since 1975! 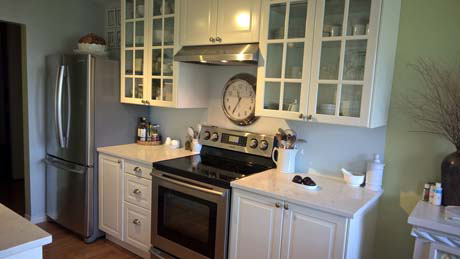 Kami Countertops Ltd has been providing quality countertop surface solutions since 1975. We are the only full service countertop manufacturer in the Interior of British Columbia. Kami Countertops Ltd. specializes in the fabrication and installation of a number of countertop products including laminates, granite, quartz and solid surface (Corian). Our extensive in-stock inventory allows us to provide timely fabrication and installation in a wide range of colours. Drop by our showroom today and talk to our experienced staff to help you coordinate your project, from countertops, cabinets, tile back splash, sinks and faucets, and finally decorative hardware. I would like to share with you our amazing experience we had dealing with Kami Countertops. My Family had recently purchased our first home and being our first home it was quite modest but full of potential. Having heard great things about Terry and his company Kami Countertops, we invited him into our home to discuss some countertop options. Terry brought with him a wealth of knowledge and experience and made my wife and I feel extremely comfortable through the process. We ended up selecting a beautiful granite countertop that fit in our budget and matched the color scheme of our kitchen. The installers worked with our renovation schedule and did an awesome job on the install. They were fun but professional and I felt very comfortable with them in our home. When it was all said and done the invoice we received was exactly what we had agreed and we were more than happy to hand over the remainder. After a post installation assessment we were informed that the countertop had brought a significant increase in value to our home and estimated that the countertop had shown a return on investment at almost 200%. You can check with your financial planner but I’m pretty sure he would tell you to jump on any investment that yielded that kind of return. I am very much looking forward to dealing with Kami Countertops on our next home and would strongly recommend engaging Terry and his team to do the same for you and yours. If anyone would like to discuss our experience with Kami Countertops please contact me at your leisure and I will tell you the same thing I have told anyone who would listen, Kami Countertops makes increasing the value of your home FUN! We just wanted to let Kami Countertops know how pleased we are with our new counter tops (they look awesome) and to especially congratulate them on their services and staff. We have to give full kudos to Colin, who went above and beyond the call of duty. He helped to reinstall our new microwave which had been improperly installed this morning. He did this without being asked to and he was genuinely glad to do it. With service like theirs, we won’t hesitate to highly recommend them to friends and family and we look forward to calling upon them this time next year when we will be remodeling our Master Bedroom/Bathroom etc.